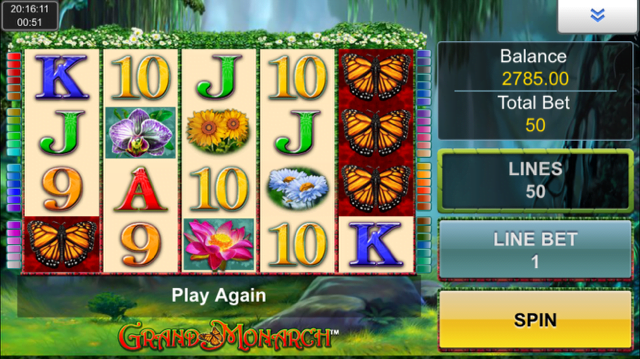 Grand Monarch slot machine is a butterfly themed title from IGT that is more appealing to players who are looking for a more relaxing playing experience. There are 5-reels, 50 paylines and a maximum jackpot of 1,000x per line, which can actually result in some decent wins due to the number of lines. There is also a free spins bonus that offers up to 5 free spins. All the details of this more sedate mobile slot are in the full Grand Monarch slot review below. While we know you mobile slot players aren’t known for your lengthy attention spans, not every game in the mobile casino market has to be about awesome superheroes or invading alien races. The Grand Monarch slot is a straightforward title from IGT slots that provides a basic, back-to-nature theme that is illustrated by flowers, chrysalises and the titular butterfly. Featuring five reels and 50 adjustable paylines, the game can be played across all desktop, mobile and tablet devices for as little as £0.50 per spin with all lines enabled, making it a title that’s perfectly suited to those on tighter bankrolls. Also boasting a colourful outdoor setting and a range of soothing sound effects, the Grand Monarch slot machine provides a pretty relaxing video slot experience overall, though it has to be said that a fairly basic free spins mode and no additional bonus rounds do little to pull the game out of its soporific slump. Indeed, in terms of added excitement, the Grand Monarch slot is sorely lacking in depth; with players having to rely solely on the free spins feature to provide any added incentive to play. Unfortunately, even this is somewhat limited in its appeal due to players only receiving five bonus games to start with. Triggered whenever three chrysalis symbols appear on the game’s central reel, players will get to enjoy their quintet of free spins on a new set of reels; but in true IGT fashion, it is only a slightly different colour scheme that differentiates them from the base game, with all pays being identical. Thankfully, players can at least retrigger this feature an unlimited number of times and the game’s most valuable icon – the Grand Monarch butterfly – does appear as a stacked symbol throughout, but even taking this into account it is a fairly limited offering that has little bearing on the slot’s RTP. While the Grand Monarch slot may provide a more tranquil alternative to some of the more bombastic slots out there, a lack of features and a miserly number of free spins prevent it from really taking flight. Like the Grand Monarch slot review? Check out these as well…..